As a newbie in blogging going through your first six months is always very difficult as your blog isn't ready to start making you money, this is even worse when you are a full time blogger because you would end up being broke as you do not have any other source of income. For you to make it to the position of a pro blogger when you would start smiling to the bank you need to be hard working, optimistic, patient and hustle hard. You need to develop your writing skills and abilities and most especially you have to be a fast learner if you want to earn. Before your blog starts generating revenue you've got to look for other ways to pay your bills and run your blog until the struggling times are over. And let me remind you, I hope your Dad gave you a personal computer at your Eightieth birthday- Amit Sharma. I am going to show you 5 things you can do on the internet without investing a dime and you would still make a little passive income. But you must not be lazy, no money comes free from the internet! This is one easy way to make some cool dollars, because people want good traffic and backlinks they are much ready to pay you to help them guestpost on authority websites. But remember you need to have good writing skills, you should infact be the Michael Jordan of contents. 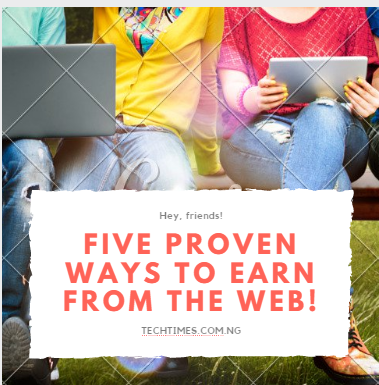 You can get paid like LindaIkeji, Amit sharman and the rest top bloggers but you must have a decent site visitors for this to be possible, so all you need do now is keep working on your traffic. Bloggers and Article writers knows content is everything so they are ready to pay just to get unique and quality articles coming into their blogs. you can source for those who need content writers on Fiverr and make atleast $5 when you sell your first gig. Firstly, do an extensive research on google and see which blogs automatically approve comments and give do-follow links. Get the list of blogs that accept comments and give dofollow links and start selling to webmasters. Help top bloggers to source for adverts and you can earn some commission. recommend advertisers to publishers. You also get into domain reselling business.